During certain stages of life, you may look around and realize that the number of girlfriends you hang out with has dwindled over the years. Some moved away, some have lives that are so incredibly busy there’s virtually no time to get together, some may travel constantly and some have significant others that they spent lots of time with. Or you may move to a new town. Making new friends is fairly easy when you’re a schoolgirl or the mother of a young child (and you’re craving adult companionship as well as play dates for your child). But after that, it gets really hard! Where do you start? Joining clubs and other group activities is a tried-and-true way to meet compatible women. Local online Meet-Up groups provide a way to take part in activities you enjoy and meet people who like the same things. The drawback is, if you work full-time or have other obligations, you can only squeeze in so many activities. Believe it or not, reputable online websites exist that allow women with similar interests to browse profiles and photos of other women in their geographic area and get in touch to see if there’s a connection. It’s a lot like online dating — only the goal is to find platonic female friends online. I know you’re rolling your eyes now and thinking that only a loser would even consider this! Truly, I don’t think I’m a loser — and I have wonderful girlfriends (read my blog post about the nicest things people have ever done for me) — but who wouldn’t want a few more friends? When my only child moved to another state for grad school and I broke up with a long-time boyfriend during the same summer, I needed to spend more time with existing and new female friends and to get involved in new activities. After reading an article in the local newspaper about Girlfriend Social, I looked it up, posted a profile, and checked in periodically (all at no cost). I wrote to a woman who seemed nice and who liked a lot of the same activities I do. She had contacted several other women who she thought would be fun to meet and set up a dinner for four of us at a local restaurant. J — the woman who initiated the meeting, and I became great friends. We email each other several times a week, we have a lot of great conversations and we get together for a few hours most weekends. Yes, it was a little odd at first – because I think we were both a little fearful that the other wasn’t what she seemed (the same thing that occurs when you date a man you met online). After hanging out in public places a few times, then visiting each other’s homes, we relaxed and realized we were both pretty normal. J is kind and nice – a great conversationalist and listener – has a wonderful sense of humor and loves crafts and thrift stores as much as I do. She also met several other nice women on the same website, and arranged another group get-together. We’ve found a compatible group of four (see the photo here) and have gotten together a number of time over the past eight months or so — visited each other’s homes, gone to lunch, had a wreath-making party, etc. The circle is widening — and the more the merrier! If you could use a few more BFFs in your life, give it a try and let me know how it goes. This entry was posted in empty nest, friends, fun, life, thoughts tips and tales and tagged empty nest, friends, girlfriend social, meeting female friends online, midlife, thoughts tips and tales. Bookmark the permalink. 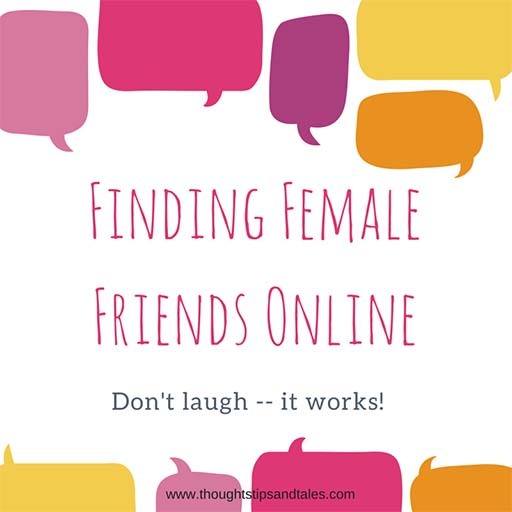 15 Responses to Finding Female Friends Online: Don’t Laugh — it Works! Love that you took control and made it happen. But I love that photo the most:). Priceless. Thanks for the kind words. 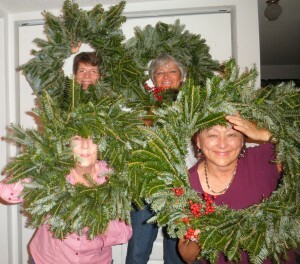 I’ve been holding wreath-making parties for my girlfriends for about 15 years now – and somehow, at the first one, we started sticking our faces through the wreaths when we took photos at the end. So it’s become a tradition! We also hold them in the air slightly over our heads as halos in other pix. We have a good time! wow what a great idea! I will have to check into this. I adore making new friends and being a good one!